136 Ann Avenue, Groton, CT.| MLS# 170138376 | Eastern Connecticut - Homes for Sale...from Mystic to Moosup & More ! From the Shore to the Country ! Looking for a Ranch home located on a quiet residential street just a short drive to downtown Mystic? This may be the one! Lovely 3 bedroom, 2 bath embankment ranch that has great space both inside and out. Main level has a large living room with fireplace, fully applianced kitchen with island and dining area with fireplace, hardwood flooring and 3 bedrooms and full bath. Living room has a large slider that leads to the raised deck that overlooks the private rear yard. The lower level has a large finished L-shaped room with new flooring and walk-in closet. There is a beautiful bath just steps away with ceramic tile, jacuzzi tub and a large walk-in shower. Lots of storage space in lower level and garage. A big portion of rear yard is fenced in, featuring stone walls, fire pit area and the steps to the raised deck. 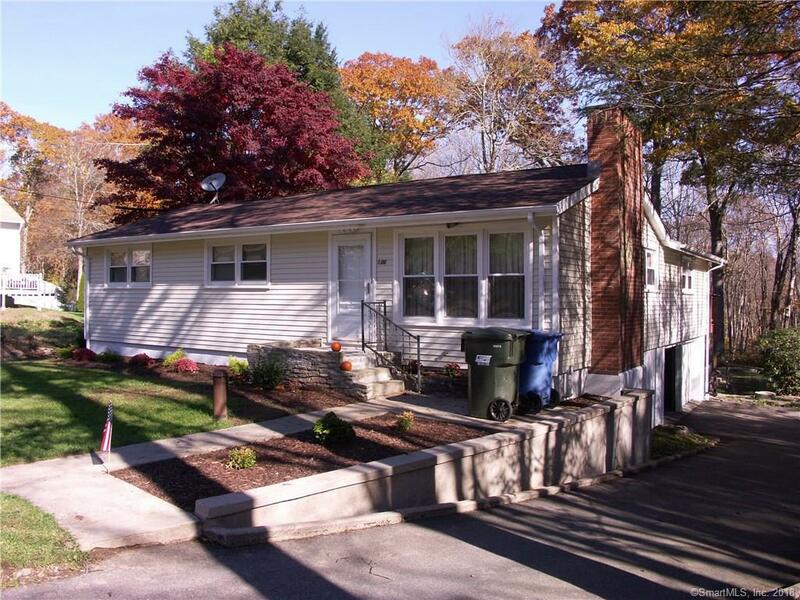 Low maintenance vinyl and a new 30 year roof make this a smart buy in Mystic.